Sunday, May 26, departing at 8:30am (8:00am from the subway). Cost: 380 RMB / 340 RMB members / 180 RMB for kids 5–12 / 150 RMB for kids 3–5; Difficulty Level 2. In Brief: A mostly-flat up-and-back walk up to a fun riverside picnic spot in Yunmeng Gorge. 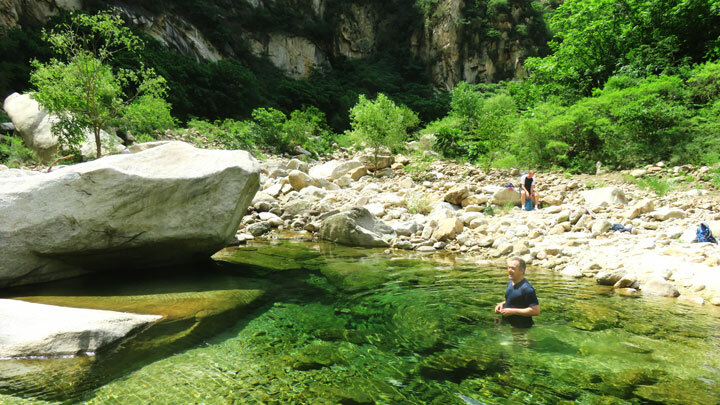 The swimming hole at Yunmeng Gorge. Kids club: relaxed outings for kids to enjoy some family time in nature. Best for ages 5–12. Younger children would need to be carried for most of the way on this hike. 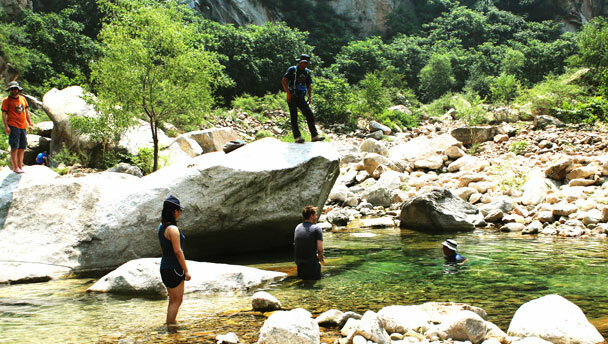 Hike an easy 4km up Yunmeng Gorge to find a sunny spot by a swimming hole; picnic, play, and explore the area before walking back out to the end. 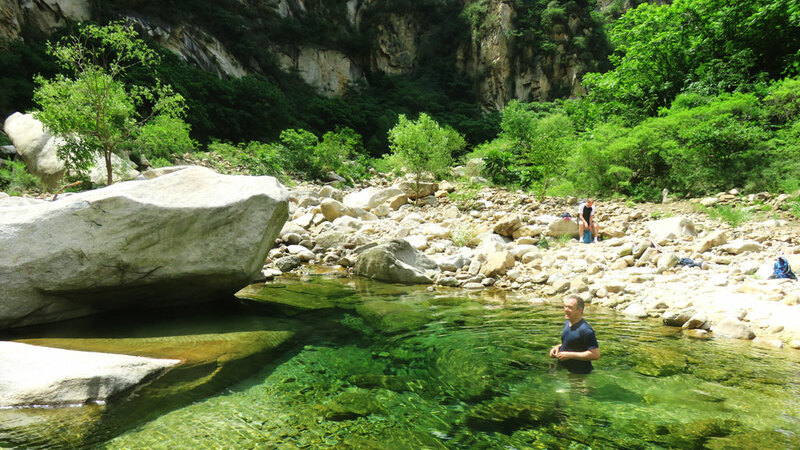 The sandy beaches and pools of water in Yunmeng Gorge make a perfect place to picnic, and the tall cliffs and big boulders make the scenery extra pretty. While there aren't specially structured activities this time, there are some fun things to do besides enjoying the views. Paddle in the swimming hole: The water in the pool is cool and clear, shallow on the edges and deeper in the middle. One side is sandy, the other side rocky—good for paddling and splashing. 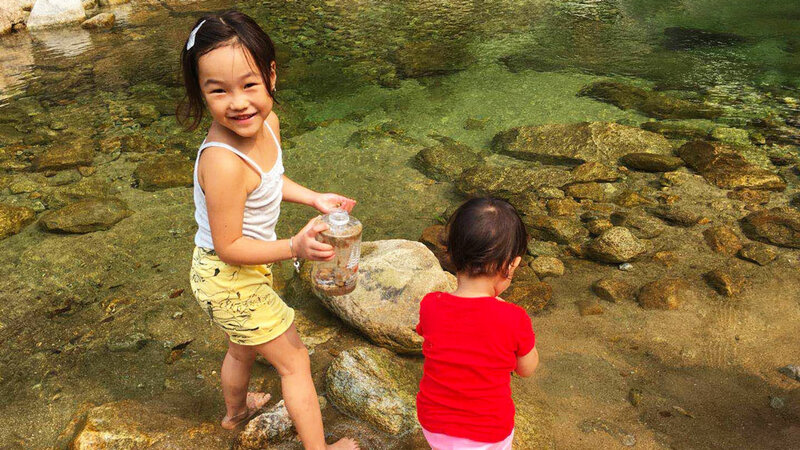 Find fish, frog’s eggs, and tadpoles: A little further down the river are shallow rock pools where we might find bunches of frog eggs … or maybe tadpoles! Hike up to a village: 20–30 minutes further up the gorge is a small village (best for older kids who want more exercise).